Coach Gollnick's Triathlon Training - Yancy Camp - Fitness for Everyone! Triathlon Coach Heather Gollnick has been coaching athletes for over 20 years and has a vast array of experience as a coach and former professional triathlete. Heather is a 5x time Ironman Champion and has won over 200 multi sport events. She has joined forces with Yancy Camp, a leader in performance coaching, to provide triathletes with highly effective, yet affordable triathlon programming. One key swim, bike and run workout weekly plus a bonus brick workout ! Programs are broken into 4 options: Sprint, Olympic, Half Iron and Ironman. The easy to follow workouts are posted in your private account each week and are developed to add structure and help increase your fitness and assist in reaching your triathlon/ race goals. All workouts include specific details of warm-up, intervals or exercises. A video library you can access through your online account to include swimming tips and drills, cycling tips, running mechanics and running drills. Access to the closed Facebook group – (Yancy Camp Triathletes) where athletes & coaches discuss information on workout details, training, racing, nutrition, recovery, life stories, pre and post-race information and questions, and so much more. Triathlon specific Fitness & Challenge Testing Program. You’ll complete the Fitness Testing and log your results within the first few weeks after registering and periodically you’ll re-test and log so you can keep track of your improvements. *Challenge Testing can be completed whenever you’d like – invite a friend! Our goal with this program is to provide you with a triathlon training program that helps you bring more structure to your training so you can maximize your training time as you work toward reaching your goals. Our current members have had great success. They are more consistent with workouts and have more fun and more success crossing the finish line. We’re confident you’ll enjoy the program and the results and we provide it all for only $29/ month. Your membership is month to month recurring charge, and you can cancel anytime without question. Use of a Heart Rate Monitor or Power Tap is helpful. For the 30 minute Time Trial ﬁnd a road with no stop signs and with light trafﬁc. It may be either ﬂat or very slightly uphill. Avoid testing on a course with signiﬁcantly rolling hills. Use a location you’ll be able to come back to for re-testing. Do the test after a few days of reduced training so that you are rested. Testing while fatigued will not provide useful information. Warmup 20-30 minutes increasing intensity and cadence. Ride easy to recover. During the 30min time trial, ride as hard as you can but pace yourself. At the 10min mark, press the lap button on your heart rate monitor so you can capture three pieces of data: your average heart rate for the ﬁrst 10 minutes, your average heart rate for the last 20 minutes, and your average heart rate for the entire 30 minutes. Note that this does not mean you are going easy the ﬁrst 10 minutes. The entire 30 minutes is done at maximal effort. The data we are most interested in is your average heart rate for the last 20 minutes. This is a good predictor of your lactate threshold heart rate and is used to eatables your training zones. If you have a power meter, your average power for the entire 30 minutes (not just the last 20 minutes) is a good indicator of your functional threshold power (FTPm). If you do not have these get your time. Also note distance traveled and other information that affects a future test such as wind and heat. To be completed on a 400m Track. *Have a few easy days of training prior to this test. Warmup good: 15 - 20 minutes of running with 3-4 strides of 10 - 15 seconds each. Also include some mobility drills and stretching. Once you feel fully warmed up complete the time trial. Goal is to have equal splits each lap or negative split (each lap progressively faster). Record time / splits if possible. Cool down with 10-15 minutes of easy running. There are two bits of data we are looking for: your lactate threshold heart rate and your functional threshold pace (FTPa). The run test is very similar to the bike test described above. Choose a location you’ll be able to use in the future for re-tests. Run solo so you can get a true idea of your potential. Hit the lap button on your heart rate monitor 10 minutes after starting the test and again at the end of the test. If this procedure were followed in a race, your heart rate would be too high for what we are looking for. To find LTHR from a race the event would need to take about an hour. The reason for this is that you go much harder in a race than in a solo workout. Your average heart rate for the last 20 minutes is a good approximation of your LTHR. Your pace for the entire 30 minutes is what we will use for your FTPa. In testing during the other blocks, we will probably ﬁnd that your LTHR stays nearly stable while your FTPa gets faster. That’s what we hope happens. Looking for Additional Program Options? If your looking for a more comprehensive program with training 6 times a week we offer pre developed 8 and 16 week training plans for Sprint, Olympic, Half Ironman and Ironman Events. If your wanting an individualized program that offers detailed workouts which are tailored to your daily lifestyle and include real time daily feedback then our one on one program offering is for you. 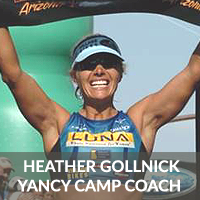 Heather Gollnick is a dynamic personality who has been a driving force in the multisport world for over a decade. She is not only a highly decorated former professional triathlete but also a USAT Certified Triathlon Coach and Level III Cycling Coach. As a 5x Ironman Champion, her records speak for themselves, but it’s her accomplishments off the course that make her unique. Heather is an author, coach, motivational speaker at a myriad of multisport camps throughout the U.S.
With all of her current activities, Heather has become a master of the work/play/train life balance. She relates with athletes on a special level and has a unique way of connecting with those athletes who are trying to balance sport, jobs and family, something she successfully navigated thoughout her stellar career. Training with Heather allows you to tap into her knowledge of Ironman distance training and racing with added confidence of knowing she’ll push you mentally to reach your goals. Heather is one of the foremost authorities on Mental Training for sport. 1st & 2nd Place Ironman & 70.3 Finishes!